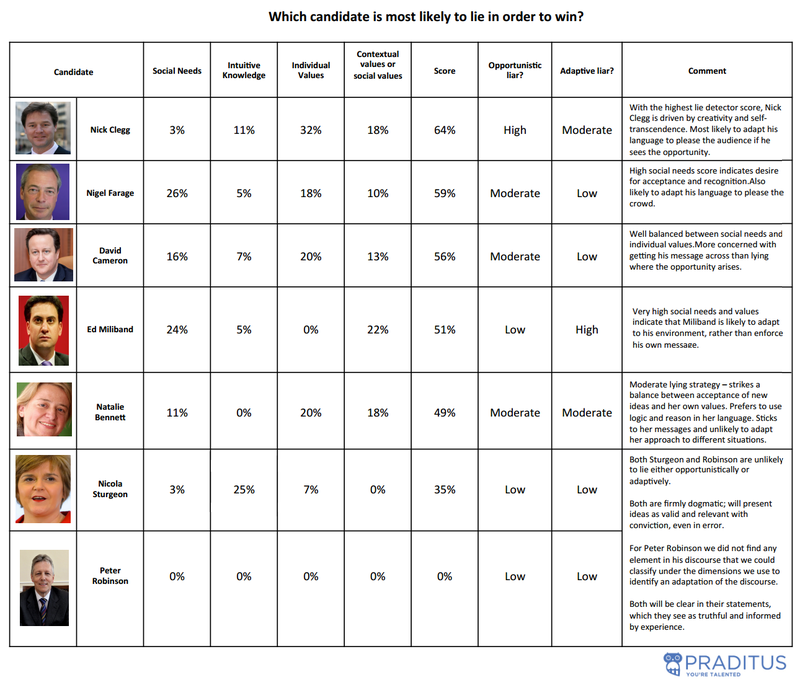 Nick Clegg is the candidate most likely to lie in order to win the 2015 General Election, according to detailed psychometric and qualitative profiling of the main general election party leaders using data captured and analysed using the Praditus Motivation Archetypes Model, which investigates internal narrative by looking at an individual’s needs, knowledge and values. Praditus analysed the communication strategies of each candidate using data from personal discourses collected throughout the Election campaign. The company then ranked each candidate by individual, social and intuitive values, determining how each would act in scenarios, including the upcoming TV debates. I’m tempted to say that for some of us, the news that Nick Clegg is a liar is nothing particularly new. But it’s nice to have it scientifically confirmed. FLAT RATE STATE PENSION FROM 2016.
with the flat rate state pension that comes into force from 2016. The poorest workers may never have been earning National Insurance history. so getting nil NI history for each year in your low waged job. even if have several part time jobs in a week. So you could be earning nil NI credits, because each job is below the LEL. Universal Credit will affect part time low waged, as replaces working tax credits from 2016 – 2017. UC will sanction part time workers for failing to gain full-time hours. from future benefit or wages. One reason low waged below the LEL is due to the salary sacrifice system, paid part in wages / part in expenses (deductions for admin). Only your wages count for the LEL entitlement. So again could be gaining nil NI credits. Mr Pride here presents a scientific study, which claims it can predict which of the leaders is most likely to lie. While I agree that Clegg is a liar, this seems to me to be a piece of either bogus, or incomplete science. I might be missing something, but the column that asks whether the individual politicians are ‘adaptive liars’ merely lists him as ‘moderate’. Cameron and Farage, by contrast, are low, but Ed Miliband is ‘high’. Perhaps I’m missing something, but the Tories are such compulsive, habitual liars that their whole elections campaigns are based on lies. They lied about ring-fencing and not privatising the NHS, for example. They’re lying about the number of people in poverty, and who have died through IDS wretched benefit reforms. And they’re lying now about the extent of the recovery. In fact they’re such liars that they’re even resorting to the Big Brother tactics of trying to rewrite history in order to deny they ever made the election promises they did five years ago. Joe Stalin would be proud. It might be that when they talk about lying here, they mean telling falsehoods spontaneously in debate, rather than relying on their party’s central messages. But as the Tories’ and Lib Dems central messages are all lies, this would seem to invalidate that focus on that particular aspect of their character. Cameron and Clegg are already liars, and will simply continue spouting the lies they have already told. Dear Tom,The people of Corby and the surrounding area are protesting about the plans for the incinerator plant between Corby and Gretton. Rob McKellar, a local counsellor who lives in Gretton, and local people are all making a stance. Rob McKellar wants to reduce the catchment area. I agree with Beastrabban, this has the appearance of pseudo science. Especially as Cameron is the only one whose “comment” is positive, and the rest seem to fall into the pattern required for the Tory campaign – big up the parties most likely to split the Labour vote , very negative about Miliband being a “liar”. This looks like a Nudge Unit piece. Interesting, but a bit creepy, and needs to be viewed critically. I think perhaps our antenna need to be tuned to spot this type of under the radar propaganda, in the same way we no longer accept the “think tank” origins of research as being “independent” of their funders political aims, whatever the MSM likes to pretend.